Flokati Rugs traditionally come from Greece. 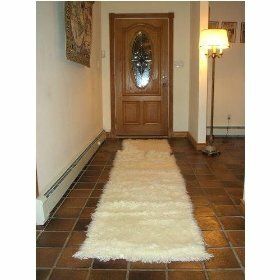 They are generally woven from wool, making these rugs are the perfect addition to any home. The best way to look after your Flokati rug is to shake it out regularly to free any dirt and to lift the wool pile. Its best not to use a vacuum cleaner but if you do, use an attachment that is gentle on the rug or just the hose but make sure you vacuum carefully so as not to damage the rug.. Authentic wool Flokati rugs should be washed by hand in warm water using a mild detergent. Although I have seen rugs that are machine washable on a gentle cycle in cold water. Just follow the manufacturers instructions on how to care for your particular rug. Rinse thoroughly and allow to air dry flat in a shady spot. DO NOT place your Flokati rug in the dryer. If the rug is grubby you may prefer to have it cleaned professionaly.